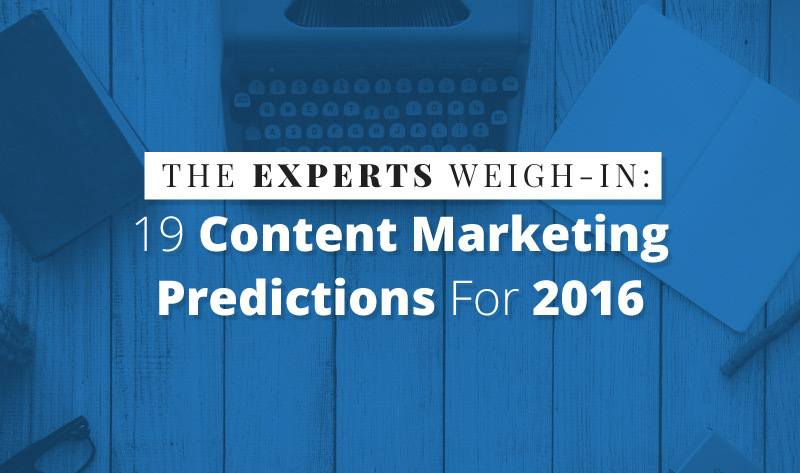 Wondering, what the top industry experts are predicting for the state of content marketing? This infographic, courtesy of Express Writers, presents 19 content marketing trends and predictions that (according to experts) are going to dominate in 2016. “The job of content marketers will be challenging in 2016. The volume of content published will continue to grow exponentially and getting your voice heard will be harder. You should research content opportunities, have an amplification strategy and a clear outreach strategy for influencers before you create content. In 2016 the battle for content engagement will be won or lost before any content is even written.” States Steve Rayson, Director of BuzzSumo. “Focus everything on building subscribers – one content type, one platform and consistent delivery over time.” Says Joe Pulizzi, Founder of Content Marketing Institute. To read more predictions about content marketing in 2016 from experts like Kevan Lee, Ted Rubin, Michael A. Stelzner, Eric Enge, Larry Kim and many others, check out the visual.